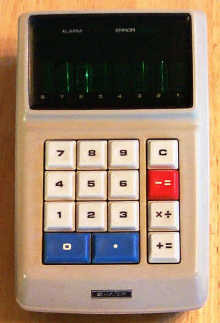 The Sharp EL-8, introduced in January of 1971, is recognized as the first portable, battery-powered electronic calculator. 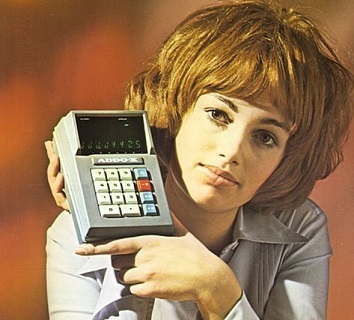 Prior to the EL-8, electronic calculators were generally desktop devices. Some calculators provided rechargeable batteries, and were small enough to move from place to place, with relative ease, like the EL-8's parent, the ground-breaking Sharp QT-8D, and the QT-8D's follow-on rechargeable battery-powered, but these calculators were just large enough that they were impractical for a jet-setting business-person to carry along on a business trip. The EL-8 is small enough that it can fit easily in a briefcase. It is definitely too large to consider a pocket calculator, but given that it was the first of its kind, it was definitely a big step ahead in the miniaturization of electronic calculators. It appears that two different cabinet color schemes were made, the off-white cabinet illustrated here, as well as a dark charcoal gray upper cabinet, with a light gray lower cabinet. It isn't clear if the cabinet color was changed sometime during production, or if the machine was initially offered in either of these colors, allowing the buyer to choose the color. 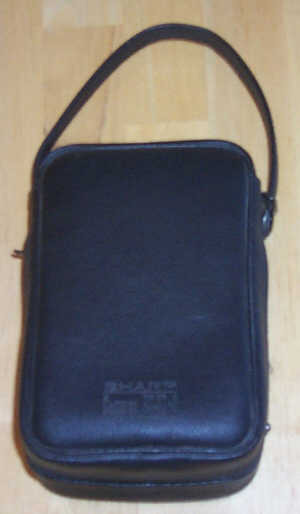 The EL-8 came with a nice vinyl carrying case that has a strap for easy carrying. 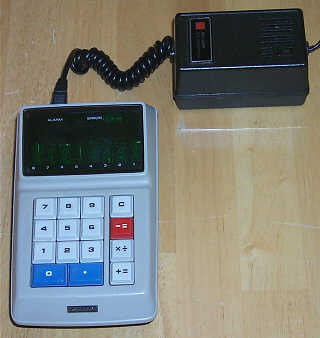 The EL-8 had a clone, the Facit 1111. Sharp made the insides of the EL-8 available to OEM customers. Facit was a major OEM customer of Sharp, producing repackaged versions of Sharp calculators for sale in the European, and later, worldwide markets. 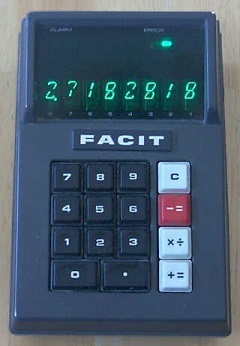 The Facit 1111 uses identical internals and operates identically to the EL-8. Facit simply wrapped a slightly more boxy and angular case around the Sharp-produced insides. Along with the Facit 1111, Sharp also sold the guts to another OEM customer, Addo, of Sweden. Addo-X was a subsidiary of Facit, operating relatively automonously at the time. The Addo-X 9364 was packaged identically to the Facit 1111, with the only differences being that the "FACIT" badge was replaced with an "ADDO-X" badge, and the coloring of the keycaps are different, with the number and decimal point keys in white with black legends, and the [C], [X÷], and [+=] keys in a medium blue with white legends. The [-=] key is the same as the Facit 1111 and Sharp EL-8, being red with white legend. 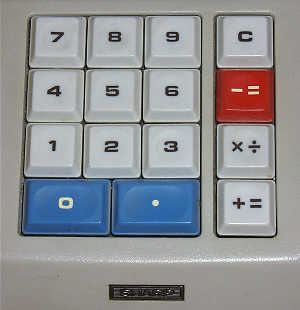 The EL-8, which was also known as the "ELSI-8", with ELSI standing for "Extra Large-Scale Integration", is a simple four-function, 8 digit floating point calculator. It uses individual Iseden-manufactured "Itron"-type vacuum fluorescent display tubes, with each digit made up of an eight-segment pattern. The digits formed by the Itron displays are unique looking, with a more stylized digit than the standard seven-segment representation used so commonly today. The most obvious characteristic of the Itron display is the half-height zero digit. The machine utilizes four Rockwell-fabricated (Sharp contracted with Rockwell as the fabricator for thier Large-Scale IC's) Large-Scale Integrated Circuits (Part numbers AU2271, DC2266, AC2261 and NRD2256) mounted on a small plug-in double-sided circuit board. A fifth IC (part number CG1121) in a TO-5 package contains the clock-generation circuitry for the LSI chipset. These chips are refinements of the original Rockwell chipset used in the QT-8D. The chips are funcionally identical to the earlier chips, but were redesigned to reduce power consumtion by half, to allow for reasonable runtime for the EL-8. See the exhibit on the QT-8D for more information on the Rockwell chipset. The display, display drivers, power supply, and other miscellaneous circuitry reside on another board that plugs into the edge-connector-based backplane, along with the keyboard assembly. The machine uses a rechargeable NiCd (Nickel Cadmium) six cell (7.2V) battery pack for power when running without the AC adapter. The external power supply/charger module plugs into a connector on the back panel of the machine for operation from AC power, or for charging the NiCd batteries. The EL-8 minimizes the number of keys on the keyboard by having a dual-function multiply/divide key. To multiply, the operator enters the multiplicand, then presses the [X÷] key, then the multiplier is entered, followed by pressing the pressing the pressing the pressing the [+=] key to calculate the result. To divide, the dividend is entered follwed by a press of the [X÷] key. The divisor is entered, and then the [-=] key is pressed to calculate the answer. The keyboard on the EL-8 is laid out the same as that of the Facit 1111, but Sharp opted for a more colorful keycap scheme, with blue zero and decimal point keys. The EL-8 is a relatively fast machine, with the "all-nines" divided by one calculation taking perhaps 0.2 second to perform. The machine properly handles negative numbers, with a small vacuum-fluorescent tube located above the numbers in the display that displays a '-' when the number on the display is negative. The machine also accurately detects overflow, lighting a dot next to an area on the display panel with an "ERROR" nomenclature. The EL-8 does not detect divide by zero properly, and goes into an undefined state which requires the machine to be cleared with the [C] key before it will return to normal operation. Check out the page on the Facit 1111 for more information that applies to the EL-8, including internal pictures.